Máximo Francisco Repilado Muñóz was born in Siboney, in the province of Santiago de Cuba, cradle of the trova and the son, into a peasant family that had no musical tradition. In 1916 the family moved to the neighboring city of Santiago de Cuba. He began to work as a cigar maker and a barber. His first unforgettable experience with music took place when he was seven years old, in 1914, when he saw a man get off the train, guitar in hand. It was Sindo Garay. He began to study the tres and the guitar self-taught. Three years later he invented his own instrument, which he named the “armónico” [the harmonious], providing it with the characteristics that best suited him. He’d managed to join the elements that would make his music unique. During his first years in Santiago he learned music theory with the young girl Noemí Toro, and shortly afterwards learns to play the clarinet with maestro Enrique Bueno. Repilado’s most intensive course surely became his immersion in Bohemian Santiago from the twenties on. From a very early age he came to know trova musicians as famous as Sindo Garay, who was close to the family, Miguel Matamoros and Ñico Saquito. The first musical group he joined, together with other children, was the Seis Ases [Six Aces] sextet. And although the exact date is not known, he also formed part of three estudiantinas, which were student groups that played traditional music. Before the age of twenty he had become the clarinet player of Santiago’s Municipal Band, directed by maestro Enrique Bueno, his clarinet teacher. He began to appear with his “armónico” in radio stations, singing his own songs. Later he would form part of the Cubanacán Quartet, the first group where Repilado would give free rein to the sounds of his musical instrument. A year later, he joins the Cuban Stars Quintet, directed by Ñico Saquito, which worked on a publicity campaign for the paper El País. It is with this quintet that he first comes to Havana. Repilado soon comes into contact in Havana with popular performers of his kind of music. He frequently visits Justa García. In 1936 he joins the Firemen’s Band in Regla, Havana, as a clarinet player. He later forms part of the Cuba Trio, together with Joaquín García and Evelio Machín, and they make a record for RCA Victor. Shortly afterwards he joins the Hatuey Quartet as a guitarist. It was directed by Justa. It is there where he first plays with Lorenzo Hierrezuelo. They travel to Mexico in 1938, where they participated in the films México Lindo, where they play the Ñico Saquito’s guaracha “Cuidadito, Compay gallo”, and in Tierra Brava, where they played the film’s theme song. In the forties he joins the Matamoros Group as a clarinet player. He remained in the musical group for 12 years, and it is there that he meets Benny Moré, also known as the “Sonero Mayor”. “I played with the Matamoros Group where Benny Moré sang. At the time he was not well-known, but he was a great singer. In 1942, while still working with Miguel Matamoros, he forms the Los Compadres duo, a high point in both their careers. Since they were both from Siboney, they decide to play country music of their own making, as well as by musicians from the East. The duo is named Los Compadres, after the way men traditionally greet each other in Cuba’s rural areas. Repilado, in turn, is baptized by a radio announcer as Compay Segundo and comes to be known by that name. Compay is short for compadre, and Segundo refers to the harmony he sings. From then on, they begin to make a record a month for the Panart label (which would be later sold throughout Latin America). They appear in the Cuban film Cuba Canta y Baila and travel to Santo Domingo on several occasions. In 1946, he joins his daughter Amparito and makes several records for the Gema label. At that time he also plays the clarinet with the musical group directed by Miguel Ojeda, with which he participates in the then famous radio program Clavelito. Los Compadres continued to perform until September 1955, when the duo broke up. 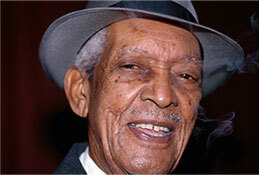 However, Repilado kept the name he had come to be known by, Compay Segundo. Shortly after, he founded the musical group Compay Segundo y sus Muchachos, first as a trio and later as a quartet, in order to popularize traditional Cuban music. The group triumphed in the Dominican Republic in 1956, sponsored by Brugal rum. After 1959, he participates in different activities and begins to work at the H. Upmann cigar factory, while continuing with this musical group. He left the cigar factory in 1970, but continued his musical activity performing with his group all over the country. “After 1959 I started to work at the H. Upmann factory. There I worked for 18 years. I sang and I worked at the factory. I never left my trade. When they needed me, they called me at the factory and I went and played for them.” There were years of less activity and the members of the group changed over time, among them, Carlos Embale and Pío Leyva. In any case, he never abandoned his music, appearing sometimes as part of other musical groups like the Hotel Daiquiri Quartet in the early eighties and the Patria Quartet, with which he traveled to the United States in 1989 to participate as a special guest in the American Cultural Traditions Festival, hosted by the Smithsonian Institute. He becomes an honorary member of said institution. He also traveled to Guadalupe and again to the Dominican Republic. Five years later he traveled to Spain to attend the First Meeting of the Son and Flamenco, hosted by the Luis Cernuda Foundation and held in Seville. He performed there again in 1995 with great success. Since then he begins to travel around the world, participating in important festivals, concerts and international events. He is sought by the European public and performs in many different countries, such as Spain, Portugal, France, Italy, Holland, Germany, Belgium, England, Switzerland, Sweden, Luxembourg, Austria, Turkey, Lebanon. He has also become popular in America and the Caribbean, in places like Mexico, Argentina, Brazil, Uruguay, Peru, Chile, the United States, Canada, Colombia, Martinique, French Guiana, Saint Martin, Puerto Rico, the Dominican Republic). Recently he traveled to Japan, performing before an audience that is used to hearing the best of Cuban music. In 1966 he works exclusively for the DroMusic label of Warner Records in Spain, and is made a member of Spain’s Society of Authors and Publishers that same year. From 1992 until 1997 Compay maintains his quartet with Compay as tenor and armónico, Benito Suárez as bass and guitar, Julio Fernández as lead and maracas, and Salvador Repilado, as chorus and double bass. In 1997 there’s a change and Hugo Garzón becomes the lead singer. In 1998 the group becomes a quintet when Rafael Fournier joins with the bongo drums. In 1999 it becomes a musical group with the talented presence of clarinet players, namely Haskell Armenteros, Rafael Inciarte and Rosendo Nardo. More recently, Basilio Repilado and Erenio Almonte join the group, with minor percussion and guitar, respectively. Compay Segundo, this popular composer and performer, with his long artistic career, has become of symbol of Cuban culture. He has richly deserved a wide range of awards, honors and medals, such as the Félix Varela Order, in the First Degree, the highest award in the field of the arts in Cuba, or the Grammy for his participation in the record Buena Vista Social Club, directed by Ry Cooder. He has lived very special moments, such as his presence in February 2000 in the Nervi Hall of the Vatican, in answer to an invitation from Pope John Paul II. In this opportunity, he sang his Chan Chan together with other artists, on occasion of the World Day of the Sick. “I told the Pope, ‘With your kindness you’ve reached the heart of the world, of humanity’. And he replied, ‘Cuban, thank you for coming! More recently, on September 30, 2000, Fidel Castro Ruz, President of the government of the Republic of Cuba, invited him to attend the official reception that was given to the President of the Islamic Republic of Iran. They have a friendly conversation, where Compay receives his respect and admiration. Compay’s greatness is complemented by his work as a composer. He has penned over 100 works in different musical genres, namely, son, guaracha, bolero, guajira, changûi and bolero-son. His music has been sung by outstanding figures such as Pablo Milanés. His expertise has been sought after by famed musicians such as the bagpiper Carlos Núñez and the U.S. guitarist and producer Ry Cooder, to whom he gave a dissertation on the son and the use of his armónico. Singers such as Silvio Rodríguez, Omara Portuondo, Charles Aznavour, and flamenco artists Martirio and Raimundo Amador have participated in his recordings. Since 1966, he has been recording a new CD each year: Antología de Compay Segundo, Yo vengo aquí, Calle Salud, Saludo Compay and Las Flores de la vida. Francisco Repilado Muñoz (Compay Segundo) contributed to the cultural heritage of Cuba and humankind. He invented a new musical instrument, the armónico. He rescued the clarinet as an essential element in the accompaniment of the son. He has been the oldest active singer in the world. And what’s more, after his 90th birthday, he has given the highest number of concerts –hundreds, standing room only– in cities and countries throughout the world, and sold the highest number of recordings after reaching that age. And if that isn’t enough, he’s left us a traditional Cuban play entitled Se secó el arroyito, inspired in a guajira he composed several decades ago. With this work, he rescues the old tradition of musicians such as Gonzalo Roig, Rodrigo Prats and Ernesto Lecuona, among others, which also form part of the Cuban theater. Francisco Repilado is perhaps, after Miguel Matamoros, the other great figure of the son, who has immortalized in his lyrics a universe of images, expressions and sayings used by Cuban farmers in their everyday conversation, with its rich humor and imagination.